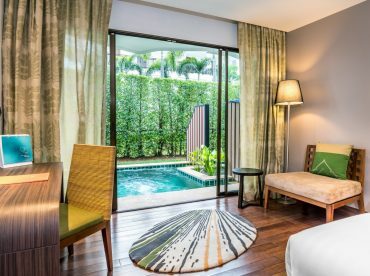 The superior rooms at Novotel Phuket Karon Resort and Spa offer 28 sqm of space and comfort, featuring a double bed or twin beds with light duvet and double pillows. The private balcony with a comfy outdoor lounge chair is the perfect place to chill out and relax at this Phuket resort. With access to complimentary Wi-Fi in a contemporary design environment, the superior room is the ideal place to enjoy a hassle-free vacation. Inter-connecting rooms are available for families and friends. Up to 2 adults and 1 child (below 12 years old) with extra-bed.